Hurricane Florence has already forced thousands out of their homes in North and South Carolina to shelters, some dozens still in need of rescuing. Whether it is a blizzard that keeps you inside for days, hurricane-related floods that reach eight feet in your home, fire that burns so fast you only have minutes to escape or a hurricane that destroys the power system, these are the natural disasters many have been warned were coming. How can we prepare and what can families do right now to make sure they survive? What preventative measures should you put in place? 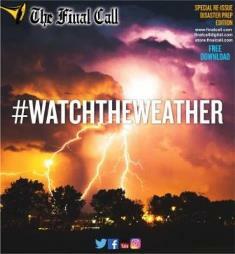 In this special re-issue of the Disaster Preparedness edition, read about weather-related disasters and how to prepare yourself and family in case of emergencies.